Adult education students will put their skills to the test by telling jokes in front of an audience at Guthrie's on April 8. LEWISTON — Adult education students will put their skills to the test by telling jokes in front of an audience at Guthrie’s Restaurant & Café at 6 p.m. Monday, April 8. 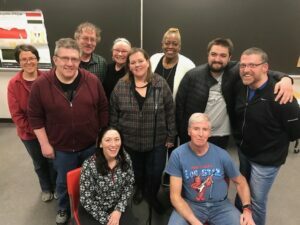 Members of the Stand Up Comedy Workshop class at Lewiston Adult Education have met for weeks with instructor Dawn Hartill to polish their stories and find ways to develop them into a series of jokes. Hartill, who has performed throughout New England, was a member of the first Stand Up Comedy Workshop class. Students in Lewiston Adult Education’s Stand Up Comedy Workshop posed for a picture with their teacher during a class at Lewiston High School. From left are Ivy Moser, Frank Spurr, Roger Poulin, Cecile Thornton, Anita Alef, instructor Dawn Hartill, Sean Crane and Stephen Amoroso. Seated are Amanda Kinsey and Chris Kinney. Students meet for one evening a week at Lewiston High School. Hartill brings a microphone, microphone stand and amplifier for students to become comfortable with the technical setup in order to speak before an audience along with helping their hone deliveries and punchlines. Comedians have made visits to the class to provide feedback, including Harold “Tuck” Tucker. Tucker also teaches the fall improv class for Lewiston Adult Ed. For more information, contact Lewiston Adult Ed at 207-795-4141.